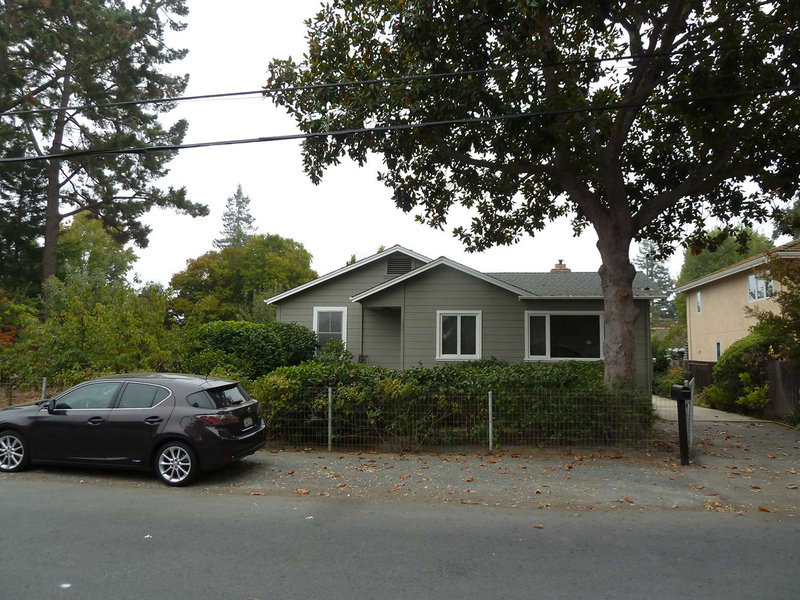 The Menlo Park project site was originally home to a modest house on a quarter acre lot, surrounded by fruit trees. Our client wanted to build a new house for their young family and wanted landscape amenities such as a pool for the whole family to enjoy, concrete and stone patios, seating walls, driveway to new garage with automatic driveway gate, contemporary feature fencing, lawn activity areas for their children to play on and new low water use planting. The style and brief of the proposed project is ‘Modern Farm House’. 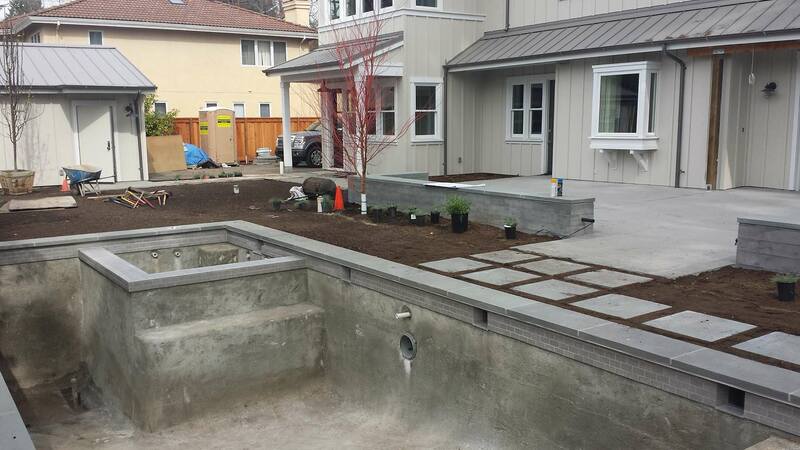 Being a landscape design-build company, Terra Ferma Landscapes was engaged to undertake the whole project from Design, Permitting, Construction Drawings and Installation. For this project, we collaborated with the Client, Architect, Engineers and General Contractor as we worked towards a landscape that is thoroughly coordinated with the clients desires, the site, house and permitting requirements. We are excited about how the project is coming together and are looking forward to completing the finishing touches. Below are progress photos of the installation of the various elements. For the outdoor kitchen and seat walls, these were constructed using integrally colored concrete with board forms to give the exposed concrete faces a wood texture look. 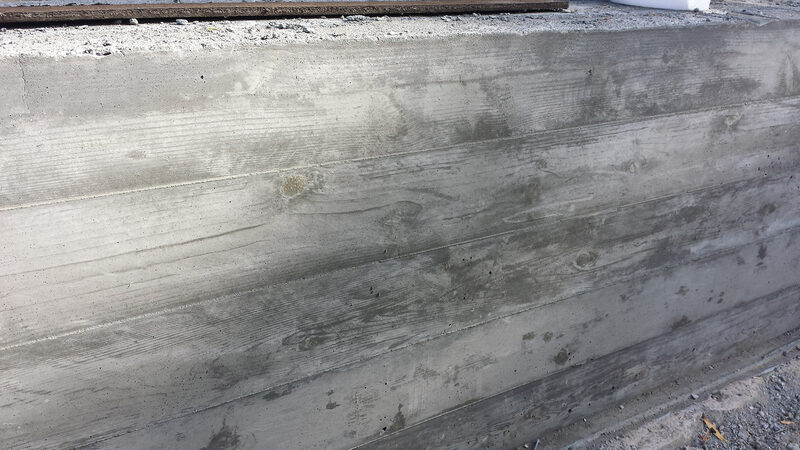 This photo shows a freshly poured concrete seat wall with the board forms removed showing the wood texture and horizontal edge of board lines. As the concrete cures, the color lightens over time. 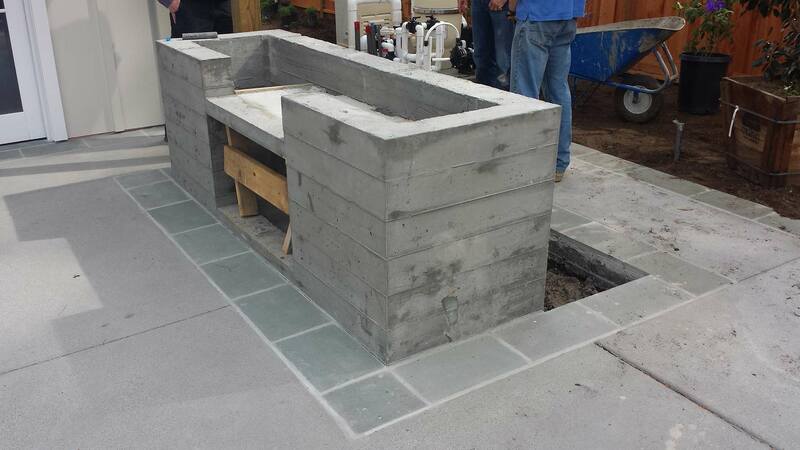 This is an in progress shot of the outdoor kitchen. Next the grill and cabinets will be installed along with the thermal finished bluestone counter. For this project, the spa is located in the pool which has a lockable pool cover that goes over the entire pool and spa. The coping is a thermal finish bluestone, with a NPT tile with a fine pebble finish plaster to be installed to the concrete pool shell. 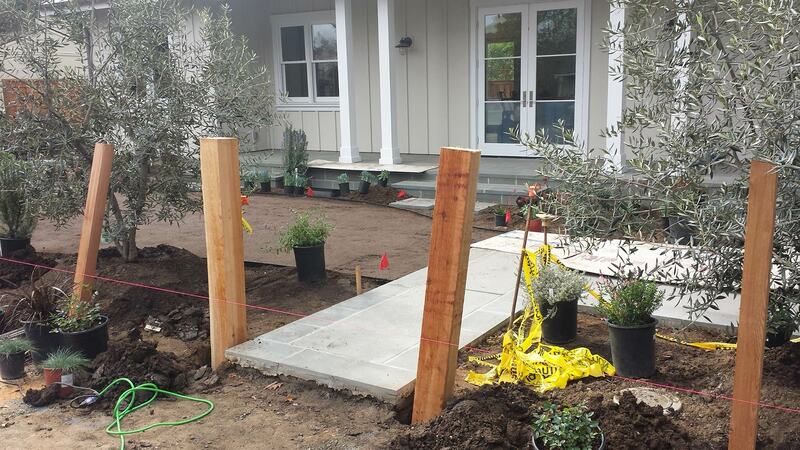 The front landscape has an integrally colored acid washed concrete path with select blue, bluestone border. For the fence, cedar horizontal boards and vertical grain cedar posts were selected. 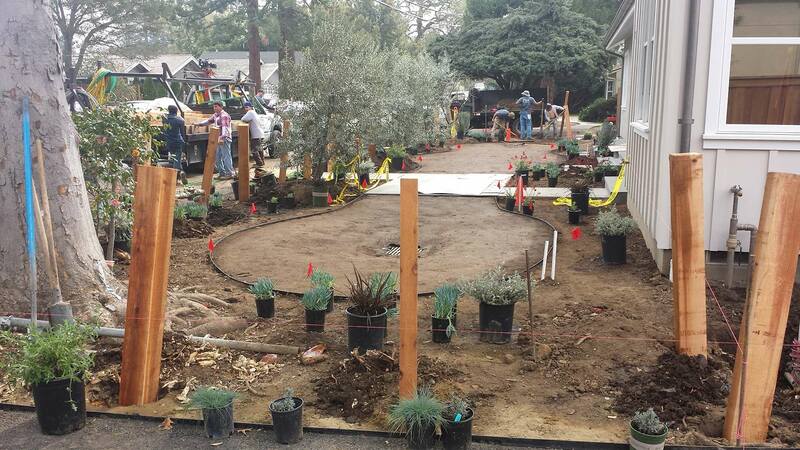 This shot shows fine grading and preparation for the installation of the lawn with shrubs and ground covers being installed to the front garden. Olive trees were selected as the primary new feature trees to the front with a large Apple tree that was saved from the site and transplanted. Final product photos to follow soon!